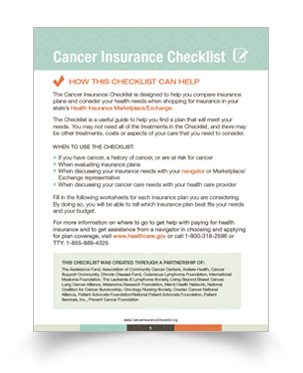 The Cancer Insurance Checklist is designed to help you when shopping for insurance on your state’s Health Insurance Marketplace if you have cancer, a history of cancer, or are at risk for cancer. Join our mailing list and receive updates on our services and more. For information about the Marketplaces/Exchanges and more helpful tools.